En-R-Gee Oil Blend Offers an Invigorating Aromatic Boost that is fresh and herbaceous, when you need it most. Diffuse or apply it topically during your morning routine or before any activity to enjoy the stimulating, spicy-pine fragrance of Rosemary, Juniper, Lemongrass, Nutmeg, Balsam Fir, Clove, and Black Pepper essential oils. This oil can revitalize you with a blend that is stimulating and has been used traditionally to help restore mental alertness. In addition, it is uplifting and strengthening as the name suggests. It simply boosts energy. 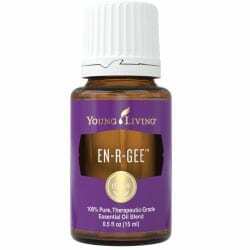 En-R-Gee essential oil blend offers an invigorating aromatic boost when you need it most! This oil was one of the most broadly used plants throughout the ages. In conclusion, this oil supports a healthy lifestyle regimen. Rosemary includes the naturally occurring constituents eucalyptol and alpha-pinene. Energizing and uplifting! Similarly, it supports the nervous and endocrine systems. A natural cleanser and detoxifier and beneficial to the skin, as well as supportive to the urinary system. Traditionally used to soothe muscles after exercise. Hence, the warm aroma of balsam fir soothes. After that, it rejuvenates body and mind. Diffusing it energizes the mind and relaxes to the body. Helps to support healthy immunity. Supportive of the digestive system. In addition, it is useful topically for soothing muscle discomfort following exercise. For aromatic use. Diffuse or put on ears and back of the neck. Put a couple of drops on a cotton ball and place in the air vent of the car, or dilute with V-6™ Enhanced Vegetable Oil Complex for full body massage. Possible skin sensitivity. If pregnant or under a doctor’s care, consult your physician. Dilution recommended for both topical and internal use. Dilute before using on sensitive areas. For instance: the face, neck, genital area, etc. Keep out of reach of children. In addition, avoid using on infants and very small children.